I've been kind of cloistered away the last few years. There were various crisis happening, and setting aside time to get out or relax was difficult. I'm also at that awkward time where my children are growing or grown and have other things to do besides family vacations. (Like getting married...) Even so, I did make time for a camping trip and some fun day trips that were the kind of thing I couldn't easily do when the kids were young. It helps to soothe the melancholy "empty nest" feelings I've been having. My nest isn't actually empty but having a teenage boy at home can feel a lot like not having a teenage boy at home, if you know what I mean. Anyway, due to the aforementioned strange years, I've neglected to post about these fun trips and many other things I saw, did, or felt. I'd like to write about them in the next few months because this blog is really the only scrapbook I actually open anymore and I want to remember some good things. In other words, be prepared for stale images. 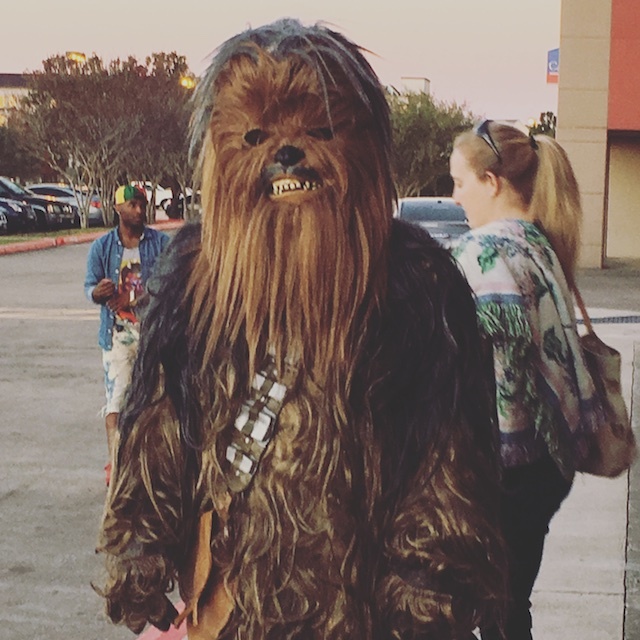 I guess it's safe to post about seeing Star Wars: The Force Awakens now, huh? Seeing that and going to a New Order concert in the same week took me squarely back to my childhood. I vacillated between feeling 10 and feeling 15 that whole week. 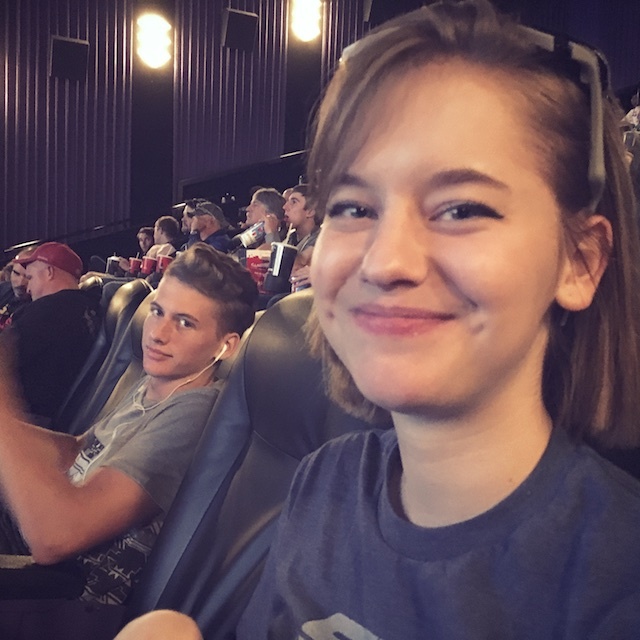 My daughter thinks it's cool that I've seen every Star Wars movie in the theatre. My first Star wars movie, Episode 4, was when I was maybe 4 at a drive-in with my family. I remember laughing as C3P0 and R2D2 crossed the corridor of Princess Leia's cruiser with bullets flying all around them, but never hitting. Then I promptly fell asleep. There were no quick releases to home DVD then. All we had were kids' read-along book and record combos. (I still have my read-along book. It's the one Anthony Daniels signed at comic con a few years ago.) Unless you were one of the few families with a laser disc or beta max player and a very expensive copy of the movie, you had to wait an eternity for Star Wars to come out for home viewing. My brother bought me a VHS set of the original trilogy for Christmas/ birthday one year when I was around 18. I was beyond thrilled. I have watched those three VHS cassettes until they were a warped ruin (well, not the Ewok saga so much). I don't really have anything to say about episodes 1-3, except that my husband and I saw them all when they came out and we don't own any of them. So, for my husband's birthday, we all went on opening night to see the show and had much fun watching this new release in a packed cinema. I love it when audience members cheer as their favorites take the screen and laugh at every joke, corny or not. It completely amplifies the experience. I was happy to be there, even if the movie had just been meh. But it had the same earnest feel as the originals. I appreciate a storyline and cast that's not too vast, since recent movies seem to be trying to outdo each other with how many storylines they can carry, simultaneously. It's not that I want simple, I just don't want cluttered for the sake of more. Of course I wish I'd have seen more of the original stars in this film, and more of them interacting to bridge the years for us. But, after episdoes 1-3, I'm just glad it wasn't a Fraggle Rock reunion. Is it a spoiler to say there were no animated, alien boy bands in a space port saloon? Two nights later we drove into Houston to see New Order play their first show in The U. S. since the 90's...maybe? I remember them coming to Texas in 1990. I was a sophomore and wanted to see the band play, rather than go to prom with my boyfriend. I couldn't imagine myself in a prom dress, so this was the answer. He said we'd do it, but of course, we didn't have cars or willing parents/ older friends, so we did neither. That was amended last Saturday night at the Day For Night Festival in Houston. My husband and I got there in time to check out some of the other bands. This was a widely varied group, so we just picked a stage and ate Indian food from a truck on the ground while we waited. I just realized my husband has been with me for most of the concerts I've been to in my life - we've been married since I was 20. I like outdoor concerts best. Except Pink Floyd, when it rained and people mobbed the exits. That was nuts. 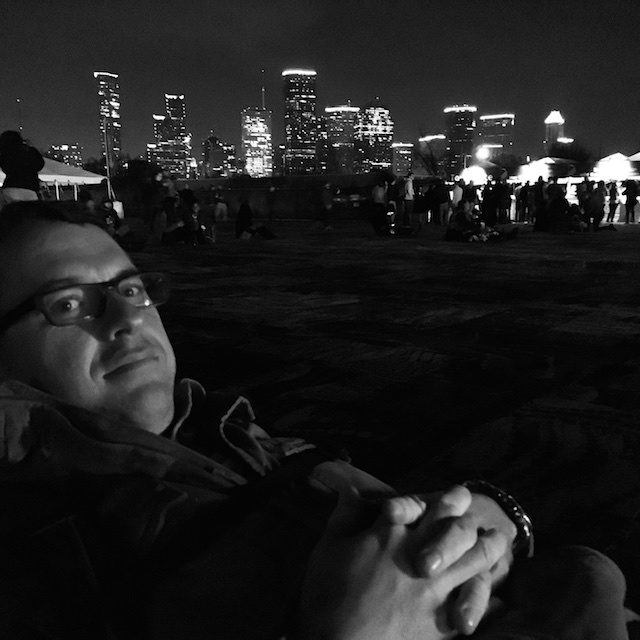 For this one, we had the brilliant Houston skyline behind us and a very retro feeling light show in front of us when New Order took the stage. Have I said that I love New Order yet? I love New Order. These songs are soundtracks to many memories and moods. Anytime I work on a project I hear Thieves Like Us and channel Molly Ringwald, making her prom dress, in Pretty in Pink. It was also our alarm song on our cd/clock for many, many years. I had to change it from Ceremony because I could never go back to sleep after hearing the first few seconds of that one. I'd just lay there, wide awake and melancholy with nostalgia. Check out the light show. It fit the whole Day for Night theme, I guess, but it so made me think of going to Pink Floyd laser light shows when I was young. I hadn't heard any songs from their new album, but we enjoyed all of them and the odd films playing behind the band as they played. The played Joy Division songs like Atmosphere and Love Will Tear Us Apart, in tribute to Ian Curtis, and all of our New Order faves like Blue Monday and Bizarre Love Triangle. At one point, I looked around me and almost everyone near me was about my age, filled with nostalgia too. Bernard Sumner said this one, Temptation, is one of his favorite songs from any band. It's mine, too. By the way, these links are mostly for me to re-live the concert whenever I feels like, but if you want a jolt of 90's nostalgia click away. And if you want to know the best links of all, it's definitely your Silent Face and Temptation.